Packet Loss - is the failure of one or more transmitted packets to arrive at their destination. This event can cause noticeable effects in all types of digital communications. The causes of packet loss include inadequate signal strength at the destination, natural or human-made interference, excessive system noise, hardware failure, software corruption or overburdened network nodes. Often more than one of these factors is involved. In a case where the cause cannot be remedied, concealment may be used to minimize the effects of lost packets. Packet Shaping - See "Traffic Shaping". Packet Sniffer - A packet sniffer is a device or software used to capture packets traveling over a network connection. The packets are logged and can be decoded in order to provide information and statistics about the traffic on the network or network segment. These tools are used for troubleshooting difficult network problems, monitoring network traffic, and detecting intrusion attempts. Also known as Packet Analyzers. Packet Switching - Packets transmitted from "point A" to "point B" all have to arrive at the same destination, but with packet switching, they do not all have to take the same path to get there. Packets can take different paths to get from source to destination, but the end result is that all the packets arrive at the destination. The packets are then reassembled to take the form of the original message. Packet switching is a very efficient way of transporting data, however, if there are packets that must arrive at the destination in the same order in which they left the source, packet switching isn't a good choice. Frame Relay is a packet switching technology, as is X.25, and both of these protocols are highly efficient. PAP - Like the name says, Password Authentication Protocol is a password-based authentication protocol that uses plaintext passwords. Typically used if the remote access client and remote access server cannot negotiate a more secure form of validation. PAP is the least secure authentication protocol. It does not protect against replay attacks, remote client impersonation, or remote server impersonation. This protocol has largely been replaced by more secure authentication protocols. Parallel Port - A parallel port is used to connect printers to computers. This connector stands out as the biggest connector (usually) on the back of your PC. It is usually next to the serial ports. It is a DB-25 connector on the PC and usually a Centronics 36 pin connection to the peripheral. *Warning* There are SCSI 1 connectors that look like this and will actually fit together - Doing so can potentially damage your printer or PC. Just look for the SCSI symbol to tell the difference. Patch Panel - A panel of network ports contained together, usually within a wiring closet, that connects incoming and outgoing lines of a LAN or other communication, electronic or electrical systems. In a LAN, the patch panel connects the network's computers to each other and to the outside lines that enable the LAN to connect to the Internet or another WAN. Connections are made with patch cables. PATHPING - PATHPING is a network utility supplied in later versions of Windows (NT, 2000, 2003, XP). It combines the functionality of Ping with that of the traceroute command (in Windows: tracert), by providing details of the path between two hosts and ping-like statistics for each node in the path based on samples taken over a time period, depending on how many nodes are between the start and end host. The command is entered as pathping ip_address/hostname. PCI - Stands for Peripheral Component Interconnect and is personal computer local bus designed by Intel. It provides a high-speed connection at 33Mhz with peripherals and allows connection of seven peripheral devices. It is mostly used with Pentium computers but is processor independent and therefore able to work with other processors. Supports PnP, Burst Mode, Bus Mastering. Utilizes the host bridge to communicate with other types of expansion slots. The 32-bit version is the most common and it has displaced ISA and VESA architectures. PCI Express - A newer bus that is also known as PCIe. PCI Express is an implementation of the PCI computer bus that uses existing PCI programming concepts, but bases it on a completely different and much faster serial physical-layer communications protocol. It provides much faster speeds and is backward compatible with traditional PCI. The 64-bit version is more common than the 32-bit. PDC Emulator (Primary Domain Controller Emulator) - With regards to Active Directory, the PDC Emulator acts like a PDC from a Windows NT 4.0 network and is necessary in domains that are not pure Windows 2000 or 2003 (i.e have Windows 95/98/NT down-level clients). If the domain is running in Native Mode then this server is the "preferred" replication partner for the other DCs for password changes and also handles account lockouts and authentication failures. PDF (Portable Document Format) - Created by Adobe, PDF files can be read on any platform with Adobe’s Acrobat Reader. In order to view PDF files in a web browser, a plug-in must be installed. PDL (Page Description Language) - PDLs are programming languages used to "describe" the contents of a page in terms that a printer can understand. When sent to the printer, a document is parsed by the driver which converts the document into the language that the printer understands and instructs the printer how to format the document. Adobe's PostScript and HP's Printer Control Language (PCL) are the 2 most common PDLs used in desktop publishing. Peripherals - Peripherals are composed of input and output devices including the mouse, keyboard, monitor, speakers, printer, etc. Mice and keyboards are input devices since they are used to provide the computer with information. Output devices provide YOU with information such as speakers, printers and the monitor. Perl (Practical Extraction and Reporting Language) - Perl is a server-side script programming language that is used largely as a language for developing CGI programs. CGI stands for Common Gateway Interface and is a standard way for a Web server to pass a Web user's request to an application program. CGI programs can tend to be server intensive. Perl requires that a Perl Interpreter is loaded on the web server. To some degree, Perl has been replaced by programming languages like ASP and PHP. Permissions - The way permissions work varies among operating systems. In general, A permission is authorization to perform an operation on a specific object, such as a file or a share. Permissions are granted by owners. If you own an object, you can grant any user or security group permission to do whatever you are authorized to do with it. Phishing - Phishing, a form of social engineering, is the fraudulent process of attempting to acquire sensitive information such as usernames, passwords and credit card details by masquerading as a trustworthy entity in an electronic communication such as email, chat, or instant messaging. PHP - PHP is a powerful, general-purpose, server-side scripting language that is especially suited for web development and can be embedded into HTML. PHP lets you create dynamic web pages which are treated just like regular HTML pages and you can create and edit them the same way you normally create regular HTML pages. PHP is designed for use on Linux/Unix web servers and PHP applications are frequently used in conjunction with a MySQL database. PING (Packet InterNet Groper) - PING is a command-line utility used to verify connections between networked devices. PING uses ICMP echo requests that behave similarly to SONAR pings. The standard format for the command is ping ip_address/hostname. If successful, the ping command will return replies from the remote host with the time it took to receive the reply. If unsuccessful, you will likely recieve and error message. PKI (Public Key Infrastructure) - A public key infrastructure (PKI) is the combination of software, encryption technologies, processes, and services that enable an organization to secure its communications and business transactions. PKI uses a public and a private cryptographic key pair that is obtained and shared through a trusted authority. The public key infrastructure provides for a digital certificate that can identify an individual or an organization and directory services that can store and, when necessary, revoke the certificates. PNG (Portable Network Graphics) - The PNG image file format was designed to replace the GIF format, and challenge JPEG for many purposes. PNG is capable of color depths from two colors, or 1 bit, to 16.7 million colors with an Alpha channel, or 32 bit and supports transparency. PoE - Generally speaking, Power over Ethernet technology describes a system to safely pass electrical power, along with data, on Ethernet cabling. Standard versions of PoE specify category 5 cable or higher. Power can come from a power supply within a PoE-enabled networking device such as an Ethernet switch or from a device built for "injecting" power onto the Ethernet cabling. IP Phones, LAN access points, and WiFi switches to RFID readers and network security cameras. All of these require more power than USB offers and very often must be powered over longer runs of cable than USB permits. In addition, PoE uses only one type of connector, an 8P8C (RJ45), whereas there are four different types of USB connectors. 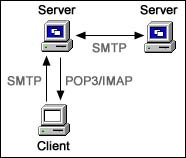 POP3 (Post Office Protocol) - POP3 is the protocol used to retrieve messages from a mail server. POP3 facilitates the downloading of messages to an email client such as Microsoft Outlook or Eudora. IMAP is an alternative to POP3 that offers more features, but currently POP3 is the most commonly used protocol for this purpose. POP3 utilizes port 110. Port1 - A single PC may be sending email, receiving a Telnet request, and accessing the Internet at the same time. Ports keep these "conversations" separate. Each potential type of conversation a host can have is preassigned a port number, and these port numbers allow different types of communications to take place over the same physical cable by keeping them logically separated. Port2 - To move software from one computer to another. To rewrite software to make it able to run in another environment or on a different operating system. Port Authentication - The IEEE 802.1x standard defines 802.1x port-based authentication as a client-server based access control and authentication protocol that restricts unauthorized clients from connecting to a LAN through publicly accessible ports. The authentication server validates each client connected to a switch port before making available any services offered by the switch or the LAN. Port Mirroring - Used on a network switch to send a copy of network packets seen on one switch port (or an entire VLAN) to a network monitoring connection on another switch port. This is commonly used for network appliances that require monitoring of network traffic, such as an intrusion-detection system. Port Scanner - A port scanner is a program designed to probe network hosts for open ports. This is often used by administrators to verify security policies of their networks and by attackers to identify running services on a host that can be exploited to gain access. PostScript - PostScript is a page description language (PDL) developed by Adobe Systems in 1982. Since that time, it has gone through a couple of revisions and the current level is PostScript 3. PostScript, often referred to as PS, is the dominant programming language used in the desktop publishing industry. When a document is sent to a PostScript printer, the document is parsed by the driver which converts the document into PostScript code. This code is sent to the printer which has a PostScript interpreter. The code tells the interpreter how to format the page, which colors to use, which fonts, and everything else needed to output the document correctly. Power Supply - The power supply converts electricity received from a wall outlet (120V AC in the USA) into DC current amounts that are needed by the various components of a computer system. PPP (Point to Point Protocol) - Provides a standard means of encapsulating data packets sent over a single-channel WAN link. Specifically, PPP provides a method for connecting a personal computer to the Internet using a standard phone line and a modem using a serial connection. PPP replaced SLIP as the standard for dial-up connections as it supports more protocols than just TCP/IP. PPPoE (Point to Point Protocol over Ethernet) - In the past, most internet users were connected to the internet via a serial modem, however, current technologies have replaced dial-up internet connections with DSL and cable, for example. In short, PPPoE is a network protocol for encapsulating PPP frames in Ethernet frames. PPTP (Point to Point Tunneling Protocol) - The Point to Point Tunneling Protocol (PPTP) provides for the secure transfer of data from a remote client to a private server by creating a multi-protocol Virtual Private Network(VPN) which encapsulates PPP packets into IP datagrams. It is mostly used to allow corporations to extend their own corporate network through private "tunnels" over the public Internet. Proxy Server - A proxy server acts as a middle-man between clients and the Internet providing security, administrative control, and caching services. When a user makes a request for an internet service and it passes filtering requirements, the proxy server looks in its local cache of previously downloaded web pages. If the item is found in cache, the proxy server forwards it to the client. This reduces bandwidth through the gateway. If the page is not in the cache, the proxy server uses one of its own IP addresses to request the page from the appropriate server.